Here are a few things you can do to alleviate ANT+ device dropouts. Scroll down for help with Bluetooth Dropouts. Placing the ANT USB stick closer to your sensors will make the USB stick more likely to pick up an ANT signal. To do this, you can move your computer or iOS device closer to your sensors. If on a computer, you can also use a USB extension cable to get the USB stick closer to your devices. 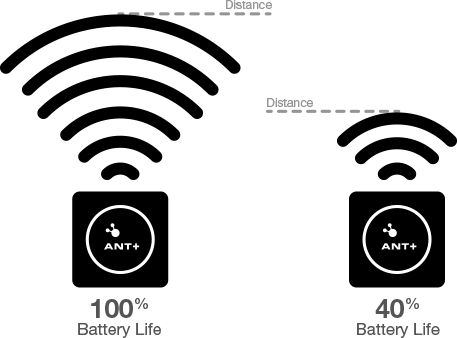 When a device battery gets low, the reception distance decreases. Try replacing the device battery. Some devices report their battery condition over ANT+ and we display that on the Devices page. But it is not a universal feature, and speed/cadence sensors can't report it due to a protocol limitation. If your head unit picks up the signal, but TrainerRoad does not, try moving your head unit next to or behind your ANT+ USB stick. Sometimes a couple feet can make a big difference. Wireless devices such as 2.4 GHz routers, wireless speakers and wireless mice may interfere with the ANT+ signal. ANT+ uses the 2.4 GHz band. Try moving any other wireless devices a couple of feet away. If you suspect your router to be interfering, you can change your wireless channel. Do your best to ensure that your computer has the most direct line of sight possible to your sensors. Simply put, the closer and more level your devices are to your ANT+ stick, the better readings you will get. Disable Garmin ANT Agent/Express and any other software that can take over the ANT+ USB stick. Some PC's have variable battery settings. If your battery is set to "balanced", your computer may not be allocating enough power to the USB ports for the ANT+ stick to work well. Switch your power-management setting to "high performance". Other wireless devices such as wireless speakers and keyboards can sometimes cause interference with your BT 4.0 devices. Try turning them off or moving them away from your setup. Originally posted by the support team at TrainerRoad.